I started 2008 with a dream to compete in my first triathlon. It's a goal I've been talking about since I was an editorial assistant working at Self Magazine in New York City. I had done my first marathon and I was ready for the next thing. I got the (sweet, bright red Specialized Sport Allez) bike for my birthday. But then I took a hard fall learning to clip in and out of my pedals among the whizzing bikes in Central Park and that became an excuse for not getting back in the saddle, as they say. I even took a couple of dips in the pool (wearing biking shorts and a sports bra). I guess I wasn't ready to commit! Finally, after two years in Chicago where I've been an editor at the weekly magazine Time Out Chicago--I made the trek back to the Midwest when my husband began a PhD program at the University of Chicago--I decided enough was enough. I had five more marathons under my belt. I still had the bike. I was now living less than half a mile from the Lake Michigan path and about one mile from the sparkling blue lanes of the University of Chicago pool. The stars were aligned. Really, if I couldn't do it now, it was never-ever going to happen. This is a long way of saying that....finally...I did it! I actually did it three times. A super mini-tri, the Olympic Distance Bang's Lake Tri and the Accenture Tri. They were all awesome. And here's the funny thing about me doing triathlons...after years of running like a gerbil through a constantly spinning wheel of marathons--and only twice managing to rip off fast times that I was proud of--suddenly my running times sped up inexplicably. I was running the 10Ks at the end of tris faster than I ever had in training or races. It was...weird. But also totally empowering and motivating. I took advantage of the fitness I gained from tris and went on to run the best half and full marathon of my entire life in the Fall (that's me, above left, with Deena Kastor at an Asics-sponsored media event two days before my PR in the NYC Marathon). I haven't had a PR since I was 24 (I'm 29 now)! I owe a lot of credit to Adam Zucco, who I seem to talk about obsessively when I'm writing about Chicago-land races for TOC (hey Adam, you rock!). He helped me out big time with my training and I worked harder and smarter than ever before. Thank you, Adam! Another big thank you goes to Kate, my dear pal, training partner and co-blogger. 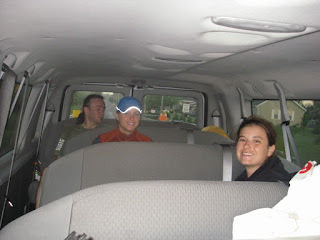 We bonded over two shower-less days in a van of strangers, running in a 200 mile relay race from Madison, Wisconsin to Chicago in June 2008 (that's us at left on Day Two in the van). It sounds funny, but on that adventure I felt like I met a kindred spirit. Kate's the only person I know who's as obsessed with fitness and nutrition as I am. But beyond that mutual passion, we have a lot more in common: a love of writing, similar college experiences, relationships and families....Plus, I look up to Kate because she is such a super-awesome little athlete and an extremely talented and accomplished swim-bike-runner (people, she's an IRONMAN, I mean..c'mon!!!). In July, I convinced her to join me for a few morning workouts each week. Two hours of cycling fly by when you're riding with Kate--even when it's 630am on a hot summer morning. Kate gave me so much advice about cycling, swimming, transitioning, training and more....I could never have done the tris this summer without her. She took me from scared newbie to aero-bar–loving cyclist in two months. I'm so psyched to be co-blogging with her and looking forward to the spring and summer of training ahead of us. My last and biggest thank you goes to my husband, Matt. In 2008 he put up with dozens and dozens of psycho early morning workouts, my constant, OCD analysis of my training and my painful cases of nerves leading up to races. Matt is the guy who went out on a wild goose chase for throw-away sweats in midtown Manhattan (because I was too spazzed out to deal and hadn't thought to buy them in Chicago) and also came back with pizza and pasta for me in and then ate in the hotel room with me, calming my anxiety the night before the NYC Marathon...when he could've met our college friends for drinks and eaten in any restaurant he wanted. He prints out excel sheets with my predicted splits and makes sure he's at the right spot cheering on virtually every course I tackle. He doesn't even bat and eye when I try to relieve my achy muscles on the foam roller in front of the TV every night. He's a good, good egg.